Computer Science Professor Amit Sahai has been named a 2019 Fellow of the International Association of Cryptologic Research (IACR), an award that is only given to a select group of cryptographers worldwide. He has been recognized for fundamental contributions in secure computation, zero knowledge, and functional encryption. IACR has established the IACR Fellows Program to recognize outstanding IACR members for technical and professional contributions. The number of Fellows to be selected in any one year is expected to be approximately 0.25% of the total current membership. Professor Sahai was also recently named a Fellow of the ACM. Sahai is the most prolific author of the 21st century at CRYPTO and Eurocrypt. He has also been a panelist and speaker at the National Science Foundation (NSF) Workshop on the Future of Trusted Computing. Advance the standing of the cryptologic community in the wider scientific and technical world and promote fruitful relationships between the IACR and other scientific and technical organizations. 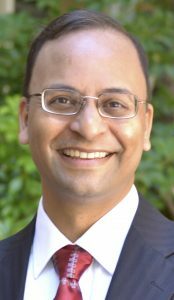 Amit Sahai is a Fellow of the ACM and a Fellow of the IACR. He received his Ph.D. in Computer Science from MIT in 2000. From 2000 to 2004, he was on the faculty at Princeton University; in 2004 he joined UCLA, where he currently holds the position of Professor of Computer Science. His research interests are in security and cryptography, and theoretical computer science more broadly. He is the co-inventor of Attribute-Based Encryption, Functional Encryption, and Indistinguishability Obfuscation. He has published more than 100 original technical research papers at venues such as the ACM Symposium on Theory of Computing (STOC), CRYPTO, and the Journal of the ACM. He has given a number of invited talks at institutions such as MIT, Stanford, and Berkeley, including the 2004 Distinguished Cryptographer Lecture Series at NTT Labs, Japan. Professor Sahai is the recipient of numerous honors; he was named an Alfred P. Sloan Foundation Research Fellow in 2002, received an Okawa Research Grant Award in 2007, a Xerox Foundation Faculty Award in 2010, a Google Faculty Research Award in 2010, a 2012 Pazy Memorial Award, and a 2016 ACM CCS Test of Time Award. For his teaching, he was awarded the 2016 Lockheed Martin Excellence in Teaching Award. His research has been covered by several news agencies including the BBC World Service, Quanta Magazine, Wired, and IEEE Spectrum.